It is pretty, and simple. It looks friendly to pods and has a lot of chokepoints, though. I wonder if you could use the trees to block up sight lines in the middle some more? I don't think I entirely agree about the pod-friendliness. The level 4 spaces are decently close to the SZ, sure, but they're 7+ spaces away, which means it will take most figures two turns to reach. Trying to set that up with multiple army cards would be a challenge in most armies. It's also very accessible from the road, especially if the opponent goes to their right. As far as LoS and chokepoints, I think I can move some things around to throw some trees in the middle and remove the walls. That should help on both accounts. October revised build instructions. EDIT: This has been further revised by moving the central trees one space backwards towards the ruins. The image above is correct except for this change. I went in to make a few changes, and ended up making more than I anticipated, but I think the map is much stronger for it. First, I removed the walls and the surrounding low ground/t-glyph/water area. The road 5-hex got bumped up to level 3. I pushed both of the level 4 rock 3-hexes forward, to make them more central (they're now 9/10 spaces away from each SZ instead of 7/13), and to make all three of the spaces attackable by melee from the road. The middle now has a much better flow for units trying to cross the road and attack the perches. I switched the orientation of the ruins and moved the trees to help block LoS from the perches. The footprint, road shape, and glyph locations remain unchanged. Last edited by superfrog; December 13th, 2018 at 04:18 PM. 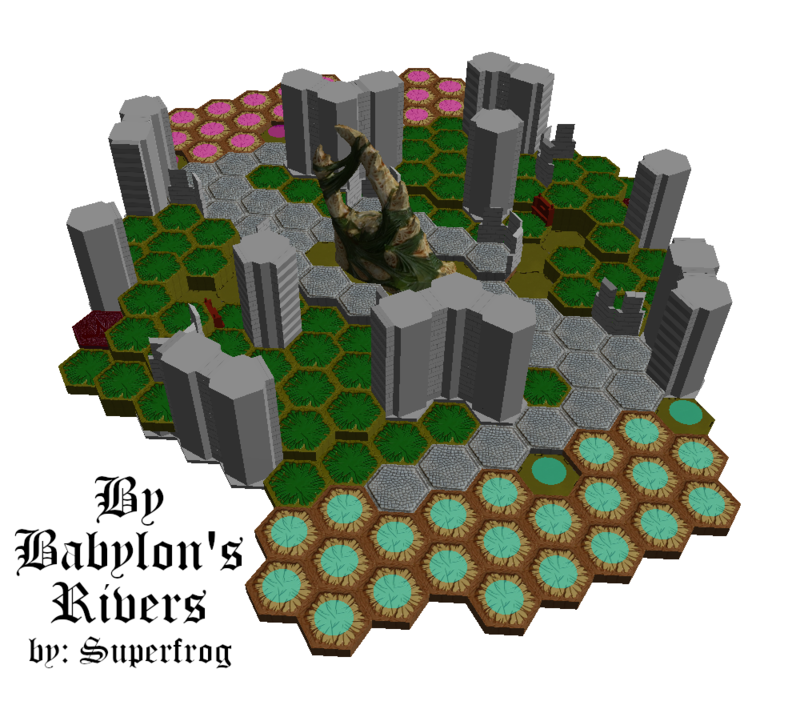 What do you think about bumping the two trees in the middle back one space towards the ruins, and bumping the two trees by the glyphs up on to the nearest space of the 3-hex heights? I might will make the first change, as it helps block LoS for figures coming around the ruins a smidge more, but I think I'll skip the second (which I did consider while rebuilding). Moving the tree up onto the height restricts LoS nicely (which is why I considered it), but it also makes the height farther from the far player and dragon-perchable. I don't usually like 2-hexes being the highest point. Calida build instructions. It uses 1 RotV, 1 RttFF, and 1 VW, with 2 random glyphs. This map went through WoS a few times and received some workshopping here in my thread as well. I settled on a version that I liked, and that version was played on in Online Season 18. I built it and was playing a few test games the other day, and I decided to lower the whole middle section by one level. Having it all up so high was really inhibiting its use and clogging things up. So I've made that change (which @awesomeunleashed suggested just about exactly 4 years ago). 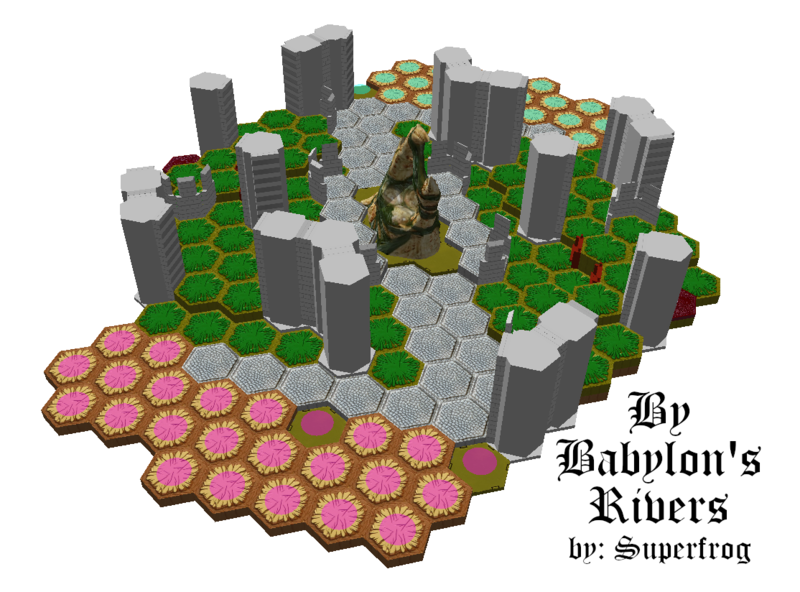 By Babylon's Rivers build instructions. It uses 1 SotM and 1 FotA, with 2 random glyphs. This is the third installment in my 1MS+1exp series, after October and [redacted]. I was looking to build something different with SotM, since I often see a similar blueprint (using lots of level 0 swamp water). I think it turned out pretty nicely, and my games on it have gone quite well. At first glance I really like it! Sorry it didn’t get to shine in the contest...very fun design. I'm excited for a shot at 3-player maps too! Made a little change to this one. Moved a few things around to change the level 0 swamp water spaces to level 1 swamp spaces. Also added another ladder in that area. I've been enjoying this map quite a bit, and this change helps speed things up going across the map towards the side hills.